It’s quite possibly the most common source of frustration for families—storage. While most of us like to keep a neat and tidy home, if you don’t have sufficient storage or you don’t know how to make the most of the storage you do have, your home can quickly start to feel cluttered and chaotic. 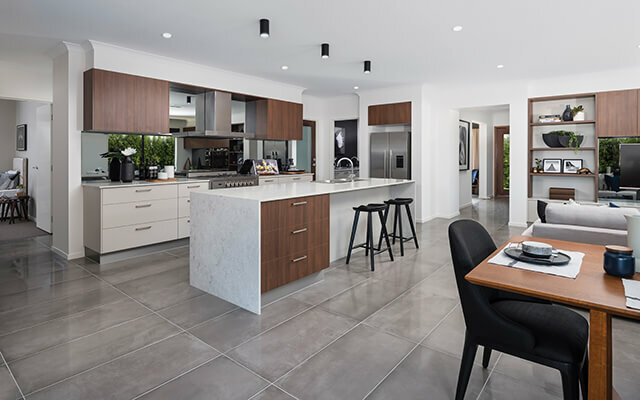 With the kitchen being one of the busiest areas of the home, a well-planned and organised pantry is essential to maintaining a clean, tidy and clutter-free home environment. That’s why we decided to pull together some of our top tips and tricks to help you get the most out of your pantry. There are a few things that can make a good pantry great—and it starts with design. 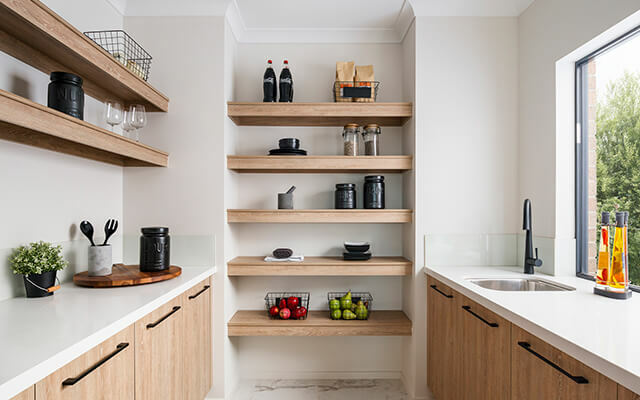 If you’re constrained to the confines of traditional pantry design with a large upright cupboard, an adjustable shelving system will allow you to make the most of the space you do have. However, if you have the luxury of some additional space, a walk-in or butlers’ pantry is the way to go. As every entertainers’ dream, a butlers’ pantry essentially provides a secondary workspace for your kitchen. 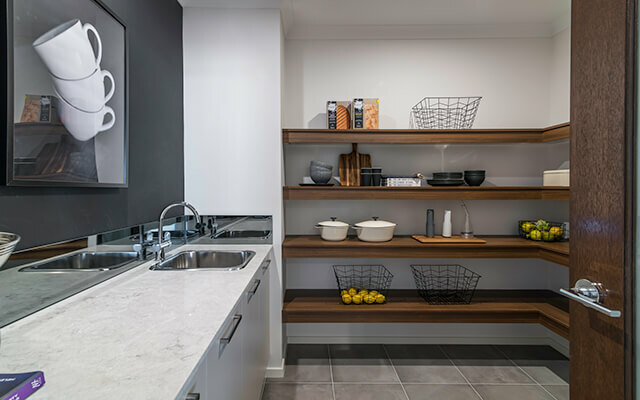 Offering a combination of cupboards and open shelving for additional storage along with extra bench space to do all your kitchen-prep out of sight, a butlers’ pantry allows you to maintain a perfectly presented kitchen even when catering for a large crowd. 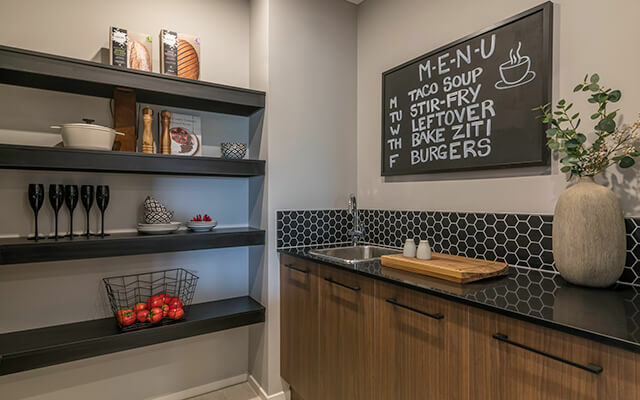 Fit out your butlers’ pantry with a sink to make for an easy post-meal clean-up, power points to plug in your kettle, toaster, microwave or coffee machine and install some good lighting to make it easy to find what you’re looking for quickly. Regardless of your pantry design, there are a few things you can do to ensure your pantry is always clean, organised and functional. Start with some transparent air-tight plastic containers in a range of shapes and sizes. They’re ideal for storing things like biscuits, cereal and pasta, and make it easy to find what you’re looking for while keeping everything fresh. Food storage clips or even some standard washing pegs are also a great way to reseal bags and packaging after opening, stopping the contents from spilling through your pantry while also keeping them fresh. You can also try hunting around in homewares and department stores for items like boxes and trays that allow you to store like-items together, a lazy susan or rotating spice rack that makes it easy to display and find items, or some elevated shelving racks that allow you to make the most of the unused vertical space at the back of your pantry. Finally, it’s also a good idea to purchase a small step stool or ladder so you can easily access any hard-to-reach items. Every day staple items that you use regularly should be stored at eye-height and within easy reach, while items that you only use every so often can be stored on higher or lower shelves. Make sure you also store any heavy or large items on the floor or lower shelves so you can save your back from any injuries when trying to access them. It can also be helpful to organise your pantry items into ‘like-categories’. Whether it be breakfast items, quick lunches, dinner ingredients, canned items, baking goods, snacks or treats, a category system will make sure you know where to find things fast and make it easy to see when you’re running low on a particular item. There’s nothing worse than going to your pantry and reaching for an item only to find its past the expiry date. To make sure you never find yourself in this situation, save a quarterly (3-monthly) reminder in your phone to do a pantry stock take. Say goodbye to anything that’s past its use-by date and give all the surfaces a wipe-down at the same time to ensure your pantry will be neat, clean and tidy year-round. Even better, try to do your clean out on a day when you’re struggling to find inspiration for what to cook for dinner that night—you could stumble across some ingredients you forgot you had which trigger some great meal ideas! Want to create your dream pantry? 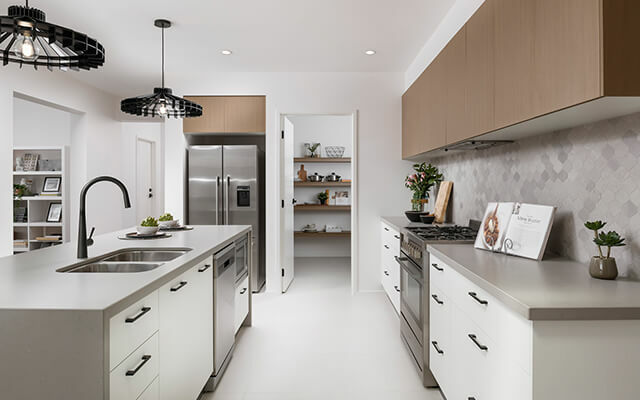 When you build a new home with the Dennis Family, you can select from a great range of home designs that come complete with the gourmet entertainers’ kitchen and pantry you’ve always imagined.